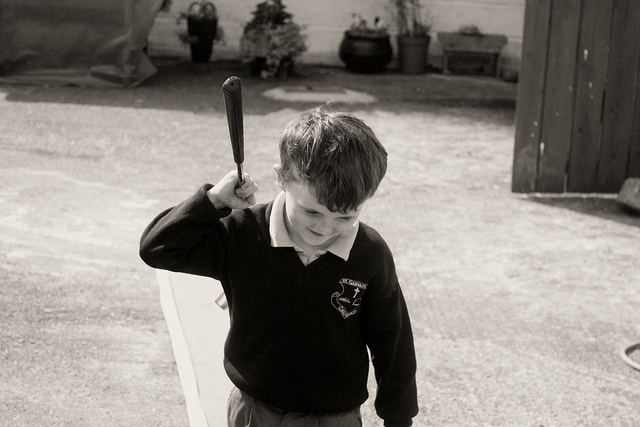 Try to recall the day that you first picked up golf. Odds are you weren’t interested in playing competitively from the very start. If you were like me, you felt the weight of the club in your hands and balanced it in your clumsy grip. You experimented with different types of clubs and swings. You felt the rush of a good hit, enjoyed the scenery, and relaxed with your friends. You didn’t care about being great – you’re just out to have a great time. While I’ve stepped up my technique and grew to care about improving my game, this isn’t what pulled me into the sport. Now, imagine what it must be like to be a child for the first time learning how to play with a seasoned golfer. How different would golf be from a child’s eyes –which are only interested with the strangely immaculate landscaping, their shiny new clubs, and the big sand-box holes surrounding the green on Hole 3? Learning the rules of golf and starting a formal training program as soon as they are able to walk isn’t the best way to train children to become skillful and appreciative of golf. I didn’t start golfing until my teenage years, and even then I was more concerned about appreciating the sensations of golf rather than nailing proper form. Before criticizing their stance and adjusting their posture for them, take a few trips to a course (or practice range) during low-traffic times. Instead of making demands, simply play with them and model your skills. Let them experiment, play, and ask questions throughout your games together. By taking these trips as a time to relax together and bond, you’ll help them come to appreciate golf for the simpler pleasures that it provides. You’ll be hard pressed to motivate and train a junior golfer before they learn to love the game. These early games won’t teach them any foundational skills, but they will help your young ones develop a lifelong appreciation of golf. As with most disciplines, making learning fun for young ones will pay off tremendously in their progress later. When golf is fun first, children are more likely to actually want to improve their performance. Your expectations of their improvement shouldn’t be formal or strict; instead, inspire the best from them with playful impromptu challenges and competitions. Facing rejection during a junior golfer tournament can be tremendously discouraging to them if you use the opportunity to criticize their performance. Instead of addressing their negatives, provide him or her with opportunities to prove their self and encourage positive performance. And of course, adjusting your expectations shouldn’t extend to just the mental game. Also think of training aids and equipment specifically tailored to the proportions of children. Light-weight or plastic clubs can be good for young ones who are having difficulty with heftier clubs. Swing aids can be attached to clubs to keep children from overextending on the backswing, for example. Make the game easier for them with such conveniences if you see them struggling. Overcoming the mental stress of golf can be enough to jeopardize the most skillful pros in the game. Taking on golf in a serious, goal-oriented manner can cause children to lose this part of the game before they even step up to tee for first time. By considering these practices, you’ll greatly enhance the odds that golf will be their lifelong pursuit.